It’s not often when a title can so succinctly sum up what a story is about. The title of this film refers to many impossibilities: the fact that the entire family survived, the fact that they were able to find each other among so much turmoil and chaos, the fact that the mother in the story Maria Belon was telling her story on the radio when a producer just happened to be listening. It’s also unbelievable that this film wasn’t nominated for a best picture. I would have nominated it for every category: acting, writing, directing, editing. And then I would have given it the award in every category. This is one of those rare films where you are transported to another place and time. Every aspect of this film is top-notch. I still don’t know how they did it. And I’m not just talking about the special effects; I’m talking about how they were able to so accurately portray the devastation and total chaos. I kept thinking that they had to have been there filming just after this event happened. That’s how realistic it is. And now that I’ve seen it, I’m really ticked off that it wasn’t nominated for more awards. I’ve seen all but two of the best picture nominated films and this one has all of the ones I’ve seen beat. Don’t wait for this to come out on DVD. This is one you want to see on the big screen. Powerful, suspenseful, engrossing, impossibly good. 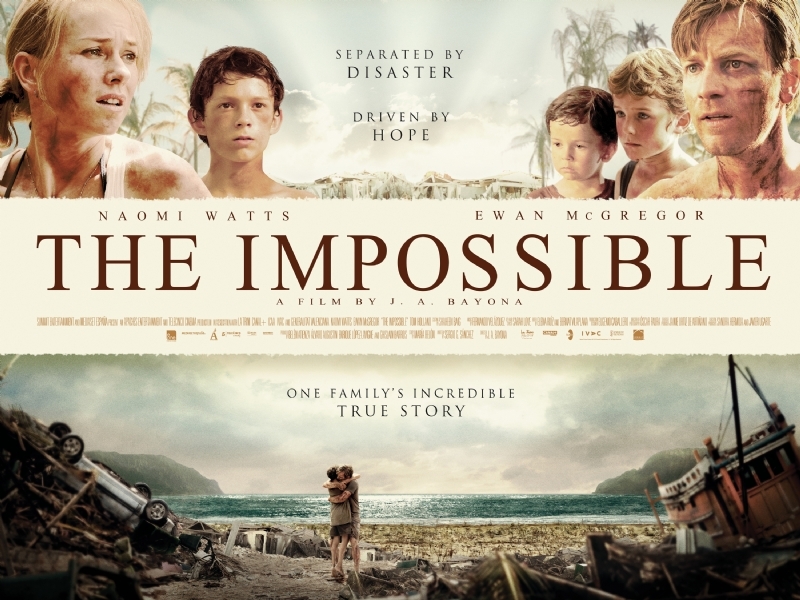 Make sure you check out the film’s web site www.theimpossible-movie.com. Also, there is an excellent documentary about the tsunami on Youtube. Just do a search Tsunami caught on camera. The documentary is split into several parts, but it’s worth your time.